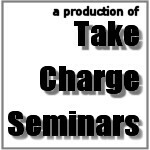 Take Charge Seminars is a division of The Gadwall Group, Ltd.
We recommend email but if you'd like to phone, our main office is 224-325-5590. Please make all checks payable to "The Gadwall Group, Ltd."
We would be happy to send one. Just email us with the request.